It’s a story that just begs to be translated into English. It’s just another naked grab for power disguised as a helping hand. We come in peace, we’d like to run your country. They really want to award the money you earned, to the people who didn’t, which includes their friends, their fans, and that enormous group of people who are about to become their friends. This is known as patronage. If you are the man handing out the money, you get the “thanks”. If you are the man forced to pay, your reward is to not-get-jailed. – how to make “clever” use of new technologies to deepen direct ties with what the U.N. calls “civil society,” meaning novel ways to bypass its member nation states and deal directly with constituencies that support U.N. agendas. The government you vote for is a “pesky nuisance”. Strangely those democratic powerhouses of nations that contribute the vast bulk of world GDP often thwart the ambitious UN would-be-dictocrats. How inconvenient. Presumably this also refers to China. Is this about saving the world AND personal megalomaniac grabs for power? Why not both? Not coincidentally, the conclave of bureaucrats also saw in “global governance” a greater role for themselves. Let’s help them: Sovereignty means having power and control over a land. Deciding who gets to stay there, who has to leave, how much people must pay in order to freely live on that land, ie: not just the Kingmakers, but the Kings. National sovereignty — meaning the refusal of major powers like India, China and the United States to go along with sweeping global agendas — was specifically indicted for the failure of the much ballyhooed Copenhagen summit on climate change. “National sovereignty remains supreme,” as one position paper noted. Climate is the most pressing excuse for their grab for control. They use the jargon “the “50-50-50 Challenge” which is their bumpersticker code for 50% more people by 2050, with 50% less emissions. Ha. Ha. Ha. Their ambitions are enormous: a drastic redistribution of global wealth, “nothing less than a fundamental transformation of the global economy.” Previously they declared the US dollar ought to be tossed out as the world’s reserve currency. The pursuit of happiness? Even that will be done on their terms. They want to tell us what we should desire (my emphasis). Yet even as the U.N. bosses talk of delivering billions from poverty, their main aim, the papers argue should be much, much larger: to limit and redirect the aspirations for a better life of rising middle classes around the world. If you have police, you need prisons… oh and courts too. But who sets the laws and appoints the judges? The peacekeepers are now also building a “standing justice and corrections element” to go with the semi-permanent police force — a permanent strike force to establish courts and prisons in nations where peacekeepers are stationed. While parts of the UN can provide some services for the poor of the world, the world is not ready for “global governance”. What stands out is that the UN bureaucrat’s ambitions are so thinly disguised: it’s as if they have never met real resistance from the cash-cow countries which support them. The one thing that gives me hope is that on a Rassmussen Poll last December, only 29% of Americans felt that the UN was an ally, and fully 15% regard the UN as an enemy. H/t Neville, Oliver, Bob from SPPI. These things will be just the first of a string of severe letdowns. Not to mention, there will be NO middle class by the time it is done. There will the Serfs, and there will be the Elite. And there will be the expanding global Jihad. But that is for another site. To better understand how the UN (doesn’t) work read “Shake Hands With The Devil” by Romeo Dallaire. It is an obscenity and gross insult to Western democratic tradition and intelligence to be in any way beholding or servile to a majority vote by a gaggle of gangsters. Liberal democracies should abandon the UN for a tighter club of our own with some basic and limited rulles of association. Those who aspire to become full members can remain associate, non-voting members with rights to speak at the forum only until they earn the right. The rest of the gangsters can please themselves what gang they join. The best ally nations and individuals have is the blinding presumption of bureaucrats on all levels. This worldview they believe so strongly to be real is false. This makes them stupid, defined in this case as “deliberately ignorant.” Their endless conclaves and Quality Circles, summits and their position papers all reflect this presumptuous attitude. Unassailable ignorance, no amount of reality can cause them to question whether any of their basic assumptions about themselves, the universe around them or the level where real people interact and create wealth. Wealth itself is a concept beyond them. If it were not so, they would have skillfully enacted a penny tax, even a fractional tax, long ago, on some common international transaction. As it is, I like them dependent on the short-term agenda that hamstrings every federal action in the United States. The frosty, inconvenient, two year election cycle of the U.S. House of Representatives. What amazes me is that the UN PR writers don’t hear the totalitarian ambition in their words. They must live in an echo chamber, they don’t even bother to disguise it. PS: I’ve added some artwork. Any better caption ideas? … I’m quite pleased with the total effect if I do say so. Peacekeepers, my arse. These are a bunch of elite megalomaniacs, with an army, no less (seen those UN troops with GUNS and TANKS?) and the full backing of all the commie leaders of the “free world” (including the US, UK and Australia). They seek out equally egotistical useful idiots (Leo DeCaprio, Bono, the late Princess Diana [until she became an embarrassing liability], etc) to push their agenda to the ignorant masses, and will not stop until they achieve their aim of World Government (which is basically here already in all but name). A few years ago, if I’d have heard someone saying the kind of things I hear myself saying these days, I’d have labelled them a conspiracy nut. But I have undergone a complete mind change, and know I am in very good company at good sites like Jo’s, WUWT, Ray Harvey’s, Steve Mac’s and many other truth seekers. There has definitely been a paradigm shift in which the sleeping masses (of which I was one) are waking up. Politicians live in political bubbles – they are sanitised and controlled environments. Joining them, in the bubble, are party stalwarts from their political faction (party), their researchers (who are also faction stalwarts), public relations propagandists (paid stalwarts), media representatives (who are quickly subverted to the party line), and political hangers-on who don’t seem to do anything of use, apart from preen a few egos in the rest of the “team”. Oh, and there are also a few regular clerical support people, who are at the bottom of the pecking order and are therefore treated like drones. With the exception of the support people, who say nothing, and the consultants who are very careful what they say and how they say it, everybody else is living the same fantasy. Nobody mentions the lack of clothes! If the emperor asks if you like his suit today, and you reply that it is a beautiful shade of blue, when somebody else has said it is yellow, then one of you is out of there – big time. So the staff and the supernumeraries make sure that they are constantly exchanging notes (drafts) with each other to ensure their mutual survival. If politicians at the country level are successful, then their cronies will find them a position in the UN. And yes, it is patronage – finding a position in the firm for an offspring of a friend (you will note that “our Kevin” wasn’t so lucky). When politicians (or others who have spent most of their working life inside the bubble) move to the UN, they are just moving to a different bubble. They are still surrounded by sycophants and grovellers. To them, it is their reality, they know no other, they expect no other, it is their right. But the good news is that all of the institutionalised arrogance and cynicism contains the seeds for its own destruction. These sorts of organisations tend to collapse under their own weight. They have no idea of how personal motivation works. They make rules, and the “great unwashed” will find all of the unintended consequences, and use them to find ways to to prosper. So the bureaucrats make more rules (which of course requires a larger organisation), and people find the new unintended consequences, and so on … You have only to look at the misuse of the Kyoto CDM in China, or the WWF grab for REDD funding in Brazil, for examples of that. The UN was formed in 1945, it is now starting to show signs that the bureaucracy is unable to cope with its own complexity. To solve the complexity problem, they will do what they always do, and add more bureaucracy, and so exacerbate the problem. My conclusion is that the UN has reached it’s half-life and is now starting its decline. This decline will not be graceful, and in the end the UN will probably cease to exist as the result of a war, as the League of Nations did before it. Has the UN ever done a damn bit of good? I’m struggling to remember an occasion. I did once see a suggestion that it be replaced with the United Civilized Nations. Membership by invitation. Governments meeting certain standards of democracy, rule of law, basic freedoms. Much of the trouble in the world still comes from Soviet efforts after WW2 and the reluctance of the west to use overwhelming force even when justified. Me thinks George Orwell was a hundred years too early. 2084 not 1984. What we need is a hardliner US president who will withold US funding to the UN. Now that Julia has her new Rainbow Coalition Cabinet Rudd is one step closer to a position in the brave new totalitarian regime. Speaking Mandarin will be a great asset I am sure. I must say the UN is starting to sound more Orwellian as time goes by… as you have all said, they live in an echo chamber and need someone to tear down a few walls to let the sunshine in. Ironically Gillard referred to the sanitising effect of sunshine but I sincerely doubt that transparency of Government is a core promise. as Martha Davis put it….sell their souls for total control…..over us! Forty years ago my Father worked for the UN FAO. As a Forestry Administrator he presided over the cutting down of native forests across central and south America and replanting with pine plantations. UN “special fund” forays into the third world seemed more about exploitation than benevolence and little has changed since then, save ramped up hypocrisy, arrogance and self importance from an organisation bloated by bureaucrats and benchmarked by ineptitude. Low volumes on Chicago Climate Exchange suggests overwhelming lack of support for the UN AGW policies. Their function is as they them selves have stated to redistribute the western worlds wealth. All in the hopes that this will pacify the poor countries, even though they fully know the poor countries only need knowledge and technological assistance to make their own wealth. In essence UN/IPCC want to make a chip redistribution without dealing any cards so the poor sods for fish’s get more money to play with without having to play a single hand, and yet all they need is just a being dealt a good enough hand and some knowledge how to play it. I would gladly have voted for Rudy Giuliani but he didn’t even last until the California primary. He was and still is the only such man on the horizon but he’ll not run again I think. Not to mention that people don’t want to hear the truth anyway. The UN does have a few hurdles left to jump over though. This November’s elections here could very easily put the U.S. even farther from their grip depending on what happens. Serves them right! A few short years ago I would have said post like these are nothing more than scaremongering, the rantings of fruit loops, I now hear people on talkback radio scoff in the same way I used to do when people warn of a one world government and the subversion of our freedoms, and realise how successfully we have been deceived because of the dolly steps taken when introducing these measures upon the worlds peoples. Otter: #1, sorry, but in other countries such as Australia, UK, NZ, Europe, Japan, etc, government health care is appreciated. I believe Canada has too. Those who truly cannot insure themselves do not have to go without medical care. I pay private insurance. But I have had relatives whose lives have been saved from cancer via the free health system. A logical outcome to being against free health systems fro the needy would be no free education, no highway systems, no subsidies to farmers or industries and so on. I would much prefer my tax dollar going to a child needing a broken leg mended than to a business needing support because of mistakes. At least no one will be able to scoff at Christopher Monkton now, about this issue. When he bought it up before Conpenhagen the “other side” thought it proved that everything he said was rubbish. Now the boot is well and truely on the other foot. Here comes the final stage of world governance that’s been planned and quietly implemented for many, many years. The populace are still unconscious; happily tucking into their pizza and watching The Biggest Loser. They will wake up one day to find themselves in slavery and wonder how it all happened. Love ya Jo, but I have not been able to authenticate these documents at all whatsoever. Also, here in the States Rupert Murdoch is not exactly considered to be the fount of all wisdom, or even a rivulet taking a bend toward the truth. As a matter of fact, he is generally considered to be a frothing, right wing maniac. Except by people who haven’t read a book since the seventh grade. Sadly, these people are legion. Especially in the States. Anyway, I don’t think you will advance your cause by quoting Fox commentary about (anything, actually) some documents and pretending that said commentary accurately portrayed the gist of said documents. To paraphrase Gary Oldman in “The Fifth Element,” I am a little disappointed. Eric, nearly all skepticism is marred by the conservative brush; you should see who Monckton gets around with, Glenn Beck and Alan Jones for example. It tends to polarize the debate. I have not been able to authenticate these documents at all whatsoever. Also, here in the States Rupert Murdoch is not exactly considered to be the fount of all wisdom, or even a rivulet taking a bend toward the truth. Nah, no one buys his media. That’s why he’s richest media mogul in America. As a matter of fact, he is generally considered to be a frothing, right wing maniac. Which would explain why more people watch Fox News than all the other network news combined. Except by people who haven’t read a book since the seventh grade. Sadly, these people are legion. Especially in the States. Heh. Yeah, point in case. Nicely illustrated. Because obviously the UN isn’t for global governance by promoting dilution of the sovereignty of nations through the imposition of supra-national laws, courts, economic and political sanctions and numerous advisory and regulatory bodies. Well, I’ll concede that quote is evidence that you haven’t read a book since seventh grade, mate. Gee whiz, the UN bolshevik mob can’t trust anybody these days! well Jo has given you a link to the quoted article – may I suggest you point out to Jo where the Fox news article is incorrect in stead of making ad hom attacks on the authors. (3May05) I have been inundated with people asking about the push by Codex, the World Health Organisation and many government agencies and instrumentalities to basically hand over the production, and marketing of supplementary medicines solely to the International Pharmaceutical Companies. Australia has signed on so it would seem and it also seems that it’s a pretty well guarded secret. It comes into play as of July the 1 st 2005. A précis as to what it’s all about can be found here. For a greater overview I suggest you visit the Eve Hillary site (http://www.evehillary.org/). Then you can look up the United Nations Framework Convention on Climate Change (UNFCCC) and find more than enough material direct from UN sources. A simple Google search on UNFCCC is all you need. All the material will be on UN run web sites. They’re making plans to run every aspect of your life just as fast as they can. 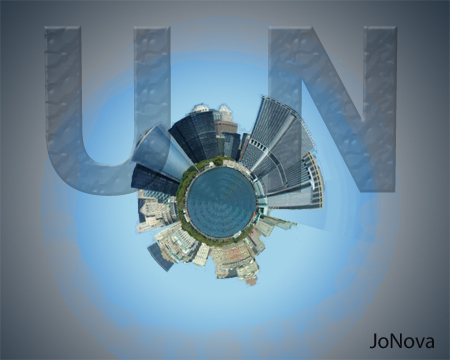 UNITED NATIONS AGENDA 21 ON SUSTAINABLE DEVELOPMENT – AN EXERCISE IN TYRANNY! 21″, in Rio De Janeiro in 1992 on “Sustainable Development”. plan for world socialist central planning in the 21st century. • Patterns of human consumption (what people eat). • Where and how people are allowed to live. • The planning of all future development world-wide. • The composition of the atmosphere (greenhouse gas emissions). • The planning and management of land use. • Control of the utilisation of forests. • Control of the development in mountain areas. • Control of types and methods of agriculture. • Control of areas set aside to protect biological diversity. • The management of genetic engineering. • Control of the use of the oceans. • The management and use of water, world-wide. • The management of wastes, including toxic chemicals, hazardous wastes, solid and radioactive wastes. • The promotion of the role of women, indigenous people, and children and youth in “sustainable development”. (Ibid). Does any of this remind you of Communism (today politely called Socialism)? Keep reading? is they happen to be doing.” (The New Times Survey, June, 2008). what industries are to be allowed and how they will operate. of children allowed and how they will be raised. (Ibid). between governments (at all levels) and private institutions. Agenda 21 is based on the principle that government is the maker of rights. (Ibid). Freedom 21 has published a DVD titled: “America’s Choice – Liberty or Sustainable Development”. “Control’ is a necessary ingredient of a World Government! The web site, http://www.environment.gov.au/commitmen … index.html states that the Australian Government has `endorsed’ Agenda 21. As indicated above, the global warming claim is part of Agenda 21! A member of a World Health Organization (WHO) panel of experts that is pondering new global taxes on e-mails, alcohol, tobacco, airline travel and consumer bank transactions, has charged that she was given only selective information at group meetings, that deliberations were rushed and that group was “manipulated” by the international pharmaceuticals industry. A logical outcome to being against free health systems fro [sic] the needy would be no free education, no highway systems, no subsidies to farmers or industries and so on. I would much prefer my tax dollar going to a child needing a broken leg mended than to a business needing support because of mistakes. Let’s try a little mind experiment. Let’s imagine that the government of the day decides what they would like to spend your money on – a shopping list, as it were. Lets assume that when you go to the ballot box to vote, you vote for the party/candidate of our choice, and then apportion 100 points against the shopping list presented by the party/candidate you have just decided to vote for. This then becomes your vote to spend x amount on health, y amount on law and order, et cetera. Now, assuming the tax rates remain the same, the overall tax take will remain the same, but the priorities have been set by the voters, when they elected the government. I think the last time this was tried was in ancient Greece, but somebody may correct me on that. Won’t happen though – you never see a politician who doesn’t think they know better than you do. It was the New Zealand UN Rep who moved the motion that precipitated the Rwandan massacre. This can be seen in the TV documentary by the same name. I always receive a jab of shame when reminded of that and the mental image of the raised hand to vote on the death sentence springs to mind. The UN in this post resembles The Beast of Revelation 13. Skeptics and Christians might be poles apart at Genesis but at least there will a topic of conversation when sharing the same cell. That essentially is the case but government is convoluted and compulsively lies. The public could hold their representatives to account if it wasn’t for the fact that they are lazy and prefer big government. Government intervenes so much that there really is no unregulated privatization but state-corporate collusion, which is why so many people advocate socialized services over private. under a ‘laissez faire’ capitaliam, private operators could do so much better with our resources. This is a no brainer. By definition Conservatism is in the business of skepticism. Progressives, with a few rare exceptions, like Alexander Cockburn, a progressive, who has been vilified by his fellow “progressives” for rubbishing ACC, for example adopts a very conservative approach to man made climate change, are suckers for the latest fads. Which is why political conservatives are far more likely to ask the hard questions on climate change. The response of the progressives is invariably an appeal to authority. I spent a few years regularly contributing a conservative perspective on the Nation’s blog site. Some Yanks do allow free speech. This is where the cream of America’s left wing are said to gather to express their opinions and engage in argument. Almost without exception the progressive’s response to the hard climate change questions was that the “consensus” view of science, on climate change, is the only possible valid interpretation of the data. When it came to arguing the details one could readily see why they relied on authority. They were scientifically illiterate, if not illogical, to the point of embarrassment. I had just about given up on Robyn Williams; then he comes up with this gem in his latest ABC Science Show yesterday. With a background in zoology, Matt Ridley was a science editor and foreign correspondent for The Economist during the 1980s and 1990s. He was non-executive chairman of the UK bank Northern Rock between 2004 and 2007, a period prior to the bank’s near collapse. He has written several books, his latest being The Rational Optimist. In this feature interview with Robyn Williams Matt Ridley describes why he is an optimist in an era where the bleak news seems never to cease. … who has “lost some of [his] respect for the ‘exeggerations’ of ‘concensus arguments’” and become an “optimistic sceptic”. Quote: “You say this is scary; Show me the evidence. And I keep being shown evidence that does not scare me”. And this: There is “no evidence for positive feedbacks on CO2″, etc. Well worth a listen. Very encouraging! Unfortunately, Auntie then reverts to type; the last 20 minutes of the program undoes all the good work when Lynne Malcolm interviews an Aussie film-maker, Chadden Hunter, who is terrified that all the Arctic ice is going to melt. Pat, last week on foreign correspondent, the ABC actually aired critical views of the May IHH flotilla activists attempting to break Israel’s embargo. What’s going on with the ABC? Llew Jones is on to something. Even Noam Chomsky (a neo-Marxist philosopher) has admitted that “most leftists are proto-fascists.” It’s a natural fit that most skeptics are libertarians and those who support an enforced climate orthodoxy based on the collectivist value of “consensus” are Leftists. The historical reality of politics is that the left/right spectrum is not linear like a number line, but a circle. Like a clock with pure individual liberty at 12. On the far side of the circle, at 6 o’clock, is the nexus of totalitarianism. You can arrive at totalitarianism by moving to the left to socialism and then on to communism or through the right to extremist nationalism (i.e. Iran). Fascism is always the final destination. Leftists love to claim that fascism is something entirely different than Socialism. In fact, they are simply two different paths to the same sordid place. What has happened since the era of Whitlam and JFK is that the left has cede the nexus of civl libertarianism and freedom to think, act and own the product of your labor to what they disparage as conservatism. Almost without exception the progressive’s response to the hard climate change questions was that the “consensus” view of science, on climate change, is the only possible valid interpretation of the data. When it came to arguing the details one could readily see why they relied on authority. They were scientifically illiterate, if not illogical, to the point of embarrassment. It would be good, and indeed edifying, if Joanne could comment on the standard of science education in the Western world. We may all be shocked. Young Kevvy was bursting with enthusiasm to cede Australia’s economic sovereignty to this lot in the name of the greatest moral challenge of our time. How much damage will he do when he gets his consolation prize? Obviously the groundwork on environmental controls predates Hanson’s 1988 address to congress. Don’t let our Pravda fool you. Remember that Aleksandr Solzhenitsyn never stopped reading the Pravda, instead he learned how to read between the lines. Today our between the lines is online. For every skeptic Robyn Williams’ presents, he has 100 stark raving mad alarmist rants. For every one unbiased report on Israel, the taxpayer funded ABC has 100 pro-Hamas. It’s called throwing the audience a bone. In their insular world it proves they are the unbiased voice of compassionate reason. Thank you, God, for the Internet. Sorry no link to my post at 47. Llew, the conservatives are equally out of touch as they are skeptical. While they had their eyes closed, the left gained momentum, last Australian federal election -perfect example, as well as paradigm shifting cultural relativity that has quietly pervaded society, etc. But I concede there is diversity amongst conservatives. You just have to be weary of dogmatists who can’t explain their actions. For example, Tony Abbott not boning up on his knowledge in order to substantiate his beliefs on climate change and in front of an ABC audience….this looks bad. Same as opposition to gay marriage, or even Premier John Brumby’s easing of water restrictions….once again, policy that comes across as short sighted, gives more power to liberals. This is why I dislike the conservative connection. I like the clock analogy Wes. …that’s Liberal in the American sense. I’m not sure just what the distinction between right and left actually is, but leftism seems to be the attitude to change the status quo, while rightism is to maintain it. That said, socialism is then state control or regulation of a person’s behaviour. Communism is the violent overthrow of the status quo by revolution and arms to achieve a socialist goal, while Fabianism the gradual infiltration and takeover of society’s institutions by incremental steps towards the same socialist goal. Fascism is the system where society is not run like a government department, but where private activity is permitted but under a pervasive regulatory system; the EU, UK, Canada, the US, Australia and NZ are such systems. In any case the UN was set up by the English Fabians as the vehicle to establish a world-wide socialist system by the moneyed elite manipulating government behind the Trilateral Commission, the Council for Foreign Relations, and the Bilderbergers; these groups are dominated by the Europeans who, after WWII, resolved never again to allow politicians to run amok, the EU being the end product of their ideals. Socialism demands an omniscient ruling class or elite, but as no one is or can be, socialism will, in all cases, ultimately fail. Not because it is an evil system, but because it cannot achieve the goals it sets for itself by the means proposed. The problem for socialists is they cannot peform economic calculation to determine whether one proposed action is better than another in achieving a particular goal. They cannot do economic calculation because of the absence of the market, and hence the non existence of money. Money does not exist of itself but becomes necessary as the intermediary item of exchgange when humans start to exchange goods and services; whether you call it money, or barter coupons or whatever, does not matter. Money is a product of the market economy. This is, of course, capitalism. Rejecting capitalism means rejecting the market economy and hence money. And if money is rejected, then how do the socialists intend to redistribute the wealth? So what game is the UN playing? Were they sent off to a remote Austrian town to do a workshop at the behest of their socialist masters in the Bilderbergers, CFA or TC to get their act together or else? And more to the point to whom does the Australian ALP owe allegiance to, given that most are paid up members of the Australian Fabian Society? We underestimate the Fabians at our peril, and while this group sell themselves as some sort of polite debating society or policy think tank, that it remains an active source of socialist policy means that the ultimate socialist goal of a global socialist state centred in the UN remains a present and clear danger. 1. My friend and his new wife are going to be paying IMMENSELY more, to get a lot less. Not to mention, the Progressive CEOs of Wal-Mart, where he works, support Oh!Bummer!Care and very likely will DROP his health benefits so he is forced to depend upon that heavily-restricted government care. 2. A lot of people who have lived on welfare, sometimes for generations, who have not and would not EVER bother to make any effort to find work and support the economy, are going to get a tiny bit more, thus ensuring their vote for the people who are stealing it from my friend. Plus I hear a LOT of people in the UK, Germany and elsewhere have long since been finding out that their government health care is rapidly going down the tubes. And last, a question: if I have a medical problem, I can go to a walk-in clinic in Canada, yes? (I should know, because this has already happened to me). Now, if I go to that clinic the help I receive is free. If I need further help, they can set things up with a specific doctor for it, and so far as I know, that is also free. IF I WAIT THREE MONTHS TO SEE THAT DOCTOR. But if I can’t wait, and have to go to the emergency room at the local hospital to have the problem dealt with, who pays? Not government health care. It comes out of my own pocket. However if I am willing to wait THREE MONTHS, getting progressively worse (and possibly NOT making it that far), then I can get it for free. I don’t know Louis, most fascist groups are socio-political in their ideologies, from Hezbollah to Adolf Hitler. I’m inclined to say most totalitarians are leftists. The left are so idiotic that they support anybody whose views are synonymous to theirs, even if such a marriage provides inherent contradictions. Take for example, the atheist left’s support for Palestine simply because both hate America. (sorry for the extra comment. Like AGW, I can never understanding how supporting something which will prove in the end UNreasonable and EXpensive to decent, innocent people in order to ‘fix’ something that didn’t need fixing, means I automatically support ‘evil’ corporations. That’s an extremely limited range of thinking). “For example, Tony Abbott not boning up on his knowledge in order to substantiate his beliefs on climate change and in front of an ABC audience….this looks bad. Same as opposition to gay marriage, or even Premier John Brumby’s easing of water restrictions….once again, policy that comes across as short sighted, gives more power to liberals. Sam I share your disappointment that Abbott was not a bit more upfront with why he was heard to call ACC crap. I’m hoping that he is now a semi closet skeptic for all the right reasons. I’d like to think that he was playing politics i.e. he probably would have been ridiculed by the large witless portion of the media as an “out of touch with the evidence skeptic” which he may have thought would have given too much of a propaganda advantage to Labor, and be too great a distraction during an election campaign. That the Coalition got so close to government and won the primary vote indicates in retrospect that he probably could have been bolder without frightening the voters. It will be fascinating to observe how the Labor/Greens alliance handles ACC. If that alliance collapses on that issue (there are plenty more that potentially will break it) because of the influence of a few, perhaps closet, skeptics on the Labor side as well, like Ferguson and maybe even Gillard (her rather silly idea of a citizen’s think tank to get consensus in the electorate is perhaps an indication of her own need to be convinced) then maybe Abbott will feel more confident to out himself. Ferguson hey? He’s in my electorate. Well, we’ll see who brakes rank in the basket case labor camp. The concept of the UN was somewhat good, but, politics and greed have interfered. There are many areas in the UN and not all the people are bad, like any other organization. I have had e-mails directly from the Secretarate for energy from Vienna and had been given some good advice on the technology for power generation. This was 5 years ago and at the time, he was interested in producing power at less than $1000/US per/kilowatt and if it could be reached, a lifetime contract for power generation facilities around the world. Only a very few companies are large enough for this type of undertaking. The company engineers thought it was a good concept and should be researched further. Which I did an later showed the designs and science as to how efficient (18 times) this was. The reply was that they were perfectly happy with their current client base and are not interested in expanding this. In other words, why would we build one turbine when we can sell 18? It’s a little naive to believe that ordinary citizens will get themselves informed without a Gore-style big-budget promotional and educational ‘wartime effort’ counter offensive – and I don’t see it happening. “An Inconvenient Truth” style production effort encompassing real truth is desperately needed. ANY system or philosophy that does not recognize, support, and defend individual rights is evil to the core. A right to violate rights is a contradiction. THAT is why it fails as a productive system. Ultimately, if you don’t have a right to your life, your thoughts, your uncoerced action, your property, and the results of your productive activity, you cannot long continue to produce. Production REQUIRES the existence of unconsumed prior production – ie profit. In a very real way, profit is the price one MUST pay to have a future. The so called omniscient ruling class simply assume they are infallible. It is reality that fails to follow their whims. When that happens, they do more of the same and act surprised when they get the same results. I contend the surprise is an act. They intend to achieve the same results. Socialism is not a failure when judged by the propose and motivation of those who seek to impose it. The goal of the socialist is not a productive system. The goal is the obliteration of the responsibility of being human: consistently using reason to sustain one’s own life and all that implies. Hence the drive to destroy any possibility of action based upon individual thinking and purpose. In this respect socialism is hugely successful. However, it is not successful from the perspective of an individual who simply wants to be able to be responsible for himself and achieve his own purpose. I just had the chance to read that. I have long believed that Obama lied when he swore to protect and defend the Constitution. He has already said it means nothing to him — regarding healthcare overhaul he clearly said he cared not a bit for the process as long as he got the result he wanted. The left lapped it up but I wonder if they know the danger they’re in. In any case, it’s not tangential to me but to the point. Does not the UN appear to share this vision? But his excesses and incompetent execution of the thing look to be his undoing. Quite correct however you left out a very important component; “Consumer Demand”. Without the existence of consumer demand, every class in society can only achieve, at best, subsistence living standards based on a bartering system which in turn creates an abrogation of incentive to produce the primary product in the first instance. Also, “Bankruptcy” is a great equaliser to excessive personal consumer demand, as it is with National (sovereign) and International Wealth Redistribution, where statutory taxes have a higher sovereign priority than the simple consumer act and transaction of paying for the weekly groceries. Like ex PM Rudd I too speak a little Mandari. I asked for a beer (Tsindao) in a bar in Beijing one day and the barmaid gave me a pair of scissors??? Well in that case I would suggest you read Jo’s post over again until you get the point. Quite correct however you left out a very important component; “Consumer Demand”. There must be production before there can be consumption. Hence, production is the primary. “Consumer Demand” is nothing but a wish without it. If the “Consumer” has nothing to trade for his “demand” but still expects it to be satisfied, he is expecting to either be a thief or have someone else do his dirty work or to be an object of charity. The “consumer” acting as a predator or asking his government to be a predator in his behalf, has abandoned his ability to sustain himself and is dependent upon those whom he expects to consume to keep him alive. This is the explanation for “socialism works as long as there is wealth to steal.” Once that wealth is consumed, it is the end of the scam. Check into the idea of trading value for value is part and parcel of respect for individual rights. Add to that, the fact that values must be produced and that production is necessary for life. Products do not appear by magic. Check into Says Law: Production creates its own demand. Check into the efficiency and effectiveness of division of labor. Answer the question “Who is John Galt”, and you will understand why I say that each of us is properly an end in himself and has no other person as a means to his ends. Its cooperative voluntary association and effort or part ways peacefully. Anything else is nothing but cannibalism in disguise. Sometimes it is not so disguised. See Obama et.al. for instructive detail on that last point. I ask the question, What better device to control the Serf than Islam? See why it is getting the nurture and protection that it does from so many western leaders and the UN ? Great comment, Lionell. As you point out, the above statement isn’t exactly true. “socialism works as long as there is wealth to steal.” Problem is we have created so much wealth to steal the ponzi scheme might take a generation to go bust and by that time we will be lost as a nation..
Far, far worse than bankrupting an economy (one can always rebuild after a financial catastrophe) is what Socialism does to the beating heart and soul of a nation. Not only will socialist wealth redistribution policies destroy the economy it will destroy the moral fiber of the nation, rendering us too divided, too filled with suspicion and soured with a bogus sense of social justice and entitlement to rebuild again. If you read Carl Marx this is the whole purpose of creeping socialism, to destroy a people’s capacity to be free individuals. The next stage is chaos followed by a dictatorship, beyond that lies a mystical collectivist utopia, which of course, is simply a secularized promise of paradise to inspire the faithful. Read this article about Greece to get the flavor of a nation so socio-psychologically damaged by socialism that no hope exists for its salvation. Scots about to be “learnt” a painful financial lesson. Rightjab » Blog Archive » The UN. Scheming totalitarians. And the delivery of international aid and debt commitments has fallen short. Africa was meant to receive an additional $25 billion per year by 2010, but has not seen even half this amount. This year alone, an additional 64 million people will fall into extreme poverty. The number of hungry people has risen above 1 billion for the first time ever. Rising prices are hampering access to medicines..
***The global aid gap is estimated at $340 billion a year between 2012-2017, including $156 billion for climate change in poor countries and $180 billion for public development. The report said the currency tax was the preferred solution, but also gave other options, including a financial sector activity tax, a value-added tax (VAT) on financial services, a broad financial transactions tax and a nationally collected single currency transaction tax.. Critics have said that any tax would only be feasible if all the world’s main financial centers agreed to levy it. Until now there is no sign that the United States is remotely interested. “The Americans are extremely important in this, but we are not alone,” Kouchner said, adding that the tax could possibly go ahead with just the 60 nations behind it. SF Chronicle: Giuliani: But “the overwhelming number of scientists now believe that there is significant human cause,” he said, adding the debate on the existence of global warming “is almost unnecessary … because we should be dealing with pollution anyway.”..
CAGW is a money grab, a power grab, and it’s best not to fall into the left/right trap if we want to stop it and restore scientific credibility. btw the only Alpbach story the entire MSM covered was a trivial bit of nonsense about a drunken chinese diplomat having a go at ban ki-moon and americans! drivel. The love of money may be the root of all evil but the exercise of power is how evil flowers. Yep…that’s what I said without the Freudism. To be clear on the point that I was making for example, looking at “Cap & Trade” scenarios, they are in effect a (carbon input) tax on primary and secondary production that the consumer may not be able to afford therefore severely dampening consumer demand, which and in turn, is a constraint that is in addition to the normal monetary and fiscal policy (normal consumer demand) that is supposed to keep a lid on inflation, deflation or stagnation. The reason I raised this from within the context of your comments is that the little “Progressives” (socialists) at the UN know this and they are using this as an adjunct to the failed Russian experiment. This carbon tax BS based on the FRAUD of man made global warming is only about an excuse to destroy the western nations and bring their populations to their knees by taxing their populations back to the stone age and giving the funds to corrupt despot third world governments! Greg Combet is a former coal engineer (not sure what they are, perhaps they meant mining engineer who focused on coal mining, but anywho) and his electorate contains a lot of coal jobs, so he has reason to protect Australia’s single largest export industry. It is an interesting choice for the post and should help to balance the Rainbow Coalition’s greener fringe who want to shut down coal mining altogether. What do you guys think? Is coal mining safe under Combet? If we paid Combet $38 million, would he speak? The new mantra to replace “moving forward” in the Labor camp seems to be “exciting”. Everything is now “exciting”, especially the “new paradigm” of having to work together in the rainbow coalition. And it would seem from the quote that even the Greens have picked up on it. “Exciting” isn’t really the term I’d use, and I picture them all with fixed grins when they speak the word. The allowances that power plants in the Northeast U.S. must buy to emit greenhouse gases fell to their lowest allowed level for the first time, selling for $1.86 a ton in the latest auction this week. Prior to accepting the position of Executive Director, Schrag was President of Hudson Strategic Energy Advisors LLC, an energy consulting firm based in New York City which specialized in advising state governments on energy and environment issues. In this capacity, Schrag has worked with the states of Wyoming, West Virginia, and Montana as well as the Western Governors Association. From 2005 to 2007 Schrag was Executive Director of the Lenfest Center for Sustainable Energy, the energy unit of the Earth Institute at Columbia University, where he also served as Research Staff with the Global Roundtable on Climate Change and as a Research Associate for Columbia University’s Center for Carbon Management. Jonathan graduated from Harvard University and received a Fulbright scholarship for research in the history of electrification. and the worser “bad news”!! The bidders at RGGI auctions include Goldman Sachs, Morgan Stanley, Merrill Lynch, JPMorgan Chase and other Wall Street heavyweights. They hope to make big money by speculating on the price of permits, called allowances. Electric power plants are required to obtain an allowance for each ton of CO-2 they emit. But exactly who is buying what at these auctions? How much of the carbon market have they cornered? What effect will the wheeling and dealing have on the electricity bills paid by consumers? Derivative investments vehicles based on carbon dioxide emissions and RGGI permits are already available through two secondary markets – the Chicago Climate Futures Exchange and the Green Exchange. RGGI is the prototype for two other mandatory regional systems scheduled to start in 2012. The Midwestern Greenhouse Gas Reduction Accord will bring cap-and-trade to Illinois, Michigan, Wisconsin, Minnesota, Iowa and Kansas. The Western Climate Initiative adds California, Oregon, Washington, Arizona, Mexico, Utah and Montana – plus British Columbia, Ontario and Quebec. Manitoba is a member of both cooperatives. Together, the three regional systems will encompass 23 states with roughly half of population in the U.S. – plus four Canadian provinces with more than three-quarters of that nation’s populace. The bottom line: A cap-and-trade system that favors secrecy over public disclosure – and Wall Street over consumers – now has the inside track to become the de facto law of the land, even without an act of Congress. once the public gets over the left/right craziness, we can put a stop to this nonsense. The CAGW paradigm can only be understood through the lens of politics. If it were only about empirical evidence then our media would be worried less about catastrophic AGW than an asteroid collision with Earth. You can’t explain the ABC’s overwhelming bias towards pro-CAGW opinion without delving into political philosophy and socio-economic motives. Jo’s blog, along with a host of others, have repeatedly documented the ever-growing body of evidence that shows the hard science doesn’t support a radical re-organization of the global economy. But the CAGW supporters deny blindingly obvious evidence contrary to AGW. The Green movement was from its inception dominated by Marxist and Hegelian historical analysis. I know this because as a young graduate student in the early 1980’s I helped pen enviro-political screeds for a deep-eco movement in Northern California. But it wasn’t until the collapse of the Soviet Union and the failed economic experiments of Eastern Europe that old-school socialists—who were only concerned with class warfare issues—really noticed and promoted the Green agenda to a flagship cause. Although, all evidence-based economists understood that centrally controlled economic models were rubbish by about 1970, it took the collapse of communism for it to become popularly understood that moderated free market capitalism is the only fair way to organize and guarantee economic freedom and prosperity for all. Nevertheless, there was (still is) a vast institutionally preserved and funded tilt in our intelligentsia towards socialism, which spent 1985-98 in a funk that their economic and social justice models had failed so dramatically on a global scale. It looked like hopes for collectivist utopia were destined for the dustbin of history. Then along came the burgeoning enviro movement with the new CAGW meme and socialists latched on to it as the ultimate justification for global, centralized control of the world’s economy and resources. Their reasoning goes like this: Carl Marx taught that the “internal contradictions” of capitalist private property rights would lead to its own economic demise. He was slightly off. Capitalism will lead to the demise of the biosphere rather than itself. The solution is much the same as it was in 1917. The socialists now had a solid moral reason (Saving The Planet) to demand a second go at their failed utopia, even if it violated the logic of economics and civil liberties. The fact that most true believers in CAGW are unaware of the philosophical basis powering the new secular religion of CAGW is a useful feature of the new faith. Few Christians that attended mass in great gothic cathedrals of Europe understood the philosophy behind their religion either. The high priests of both religions know it is no doubt best to keep it that way. “Climate Change” is a political philosophy that has appropriated the genre of science only to provide a mantle of authority. No doubt most leftist intellectuals find science distasteful, just as they find existential reality distasteful. What we are witnessing now is climate change becoming institutionalised. If Climate Change consolidates power it will shed the now threadbare mantle of science and reveal its true collectivist colours. By then it will be too late for us to extract ourselves. Perhaps, ironically the catastrophe the CAGW acolytes prophesies would be visited upon us by no less than their own hidden political agenda. To identify the driving philosophical values behind the politics of the CAGW movement in no way requires an organized conspiracy. I don’t believe in conspiracy theories. But there is zeitgeist, German for spirit of the times, and Aufheung, or the swelling tide of a new paradigm emerging from the dialectic, or evolutionary interplay, of earlier quite unrelated concepts. The total consilience between collectivism and CAGW is the Aufheung of the our age. That said, as we move into the institutional power consolidation phase of the climate faith and now that many NGOs and various ministries, even whole governments, owe their existence to Climate Change politics, naturally collusion and alliances are to be expected. You’ve cost me a lot of time reading today but it’s been worth it. I note that there are certain similarities between the Greek and U.S. consumer price index shenanigans. We pulled food out of the mix in order to keep “inflation” down and paint a rosier picture a la Greece. And it didn’t happen on Obama’s watch either. Thank you, Alan Greenspan. You owe us more than your “service” was ever worth! You should come to Australia mate. Going to emergency at your local government hospital is free. At least for now, unless we get silly and start believing all that “free market” rubbish. “John Brookes” why not leave Australia and go to some where where the ignorant masses have been fooled by the greatst confidence trick in the history of mankind! Then you can preach your anti human religion to your hearts content! Another one of your posts here is titled AGW IS A RELIGION, which of course, it is. I had an epiphany about this: Collectivist ideology is the religion, and AGW is just a facet of it. The underlying cult is ultimately communism. A sick twisted desire for ultimate power, to control others, to ration food and water, and ultimately deny them. It is the embodiment of evil. It does not require a conspiracy because it is a cult. It is proselytized among individuals, winning converts with promises of a more rewarding human experience, less responsibility, and a boogeyman for your personal failures (It isn’t your fault, the evil capitalists stacked the deck against you! ), and a big fluffy government to care for all your needs. We’re fighting a world wide cult. It has many members. But in the West I think we still outnumber them. Scroll to the inside cover (page two of the electronic document) to see the attribution. It seems all the “world” organisations are victim to the same group think disease. Jamie #87 that was uncalled for. In aussie Rules we pay freekicks against those who go for the man and not the ball. Please go for the ball, that will take care of the “man”. The weird thing is, I’m as wary of socialism as most. That is, like any system, if it supports the general good, excellent – but if it detracts from it, then its bad. Pragmatic socialism. Pragmatic capitalism too. Take the best, but not all of it. Governments have to spot disaster when it is still a long way off (and I’m not talking climate change here), and act fearlessly. It can be very difficult, because vested interests have losing their perks. Take the Greek public servants being able to retire on a generous pension at age 53! No wonder they are furious now that this unaffordable perk is gone. Australia was smarter than most, and wound back this sort of thing 20 years ago. As I said, good governments have to be ahead of the game, seeing the problems before they get out of hand. In Oz, we have many issues like this that need tackling. For example we have this weird thing called “salary packaging” which is a weird scheme which allows some people to pay less tax than others. Yet our last few governments have not moved against it. I have no idea why it still exists. The goal for any good government should be to provide the environment where everyone has the opportunity to participate in society to the best of their abilities, and to look after the less fortunate. Of course you can chuck in freedom and that stuff – because, hey, I like freedom! I’d also like it to be sustainable- so that future generations get the opportunities we did. You can just imagine a time in the future for a “no-fly zone” over the UN. John Brookes’ illustrates the typical leftist understanding of economics… “Going to emergency at your local government hospital is free.” That’s right John it’s FREE. Doesn’t cost anyone a penny. Just kidding. It actually costs everyone heaps in taxes and its execution is often poor. That’s what Americans should take away from the Australian health system. It can be done in a small country. But it’s still a two or more tier system, with anyone who can afford it opting for American-class private hospitals with the poor stuck in an almost Dickensian public system. I can only imagine the bedlam of socialized medicine in a nation of 300 million poor souls. What Australians should take away from the US medical system is that’s where most of the world’s medical innovation comes from, driven by greedy entrepreneurialism in a (highly regulated) free market of goods, ideas and services. Obamacare has replaced that with a patronage system which rewards conformity so the pace of practical medical advances will now slow to a mere trickle compared to the last few decades. Hopeless change. My mother-in-law age 74 needed a hip replacement. She was taught to believe in our “free” medicare system. They told her she would have to sit in a wheel chair for up to a year before a surgery slot was available. Oh, and btw, the synthetic joint she would receive wasn’t going to be the latest model, but an older cheaper one that would need replacing sooner. Oh, and she would have to recuperate in a noisy public ward with bathrooms so dirty my wife chose to wait until we went to a petrol station later. And this is Melbourne. Australia’s wealthiest city. Oh, and btw the one year wait in a wheelchair was unreasonably optimistic we were told off the record, 2 years was more likely. (However, if you are friends with the local member of parliament he can pull a few strings to jump the queue, I kid you not!) That’s the way it works in a government controlled system. We bought my mother-in-law her hip replacement at a private hospital. No wait required. The fact is, any savvy Australian that can afford private health care insurance has it. wes – that requires a reply. Two years ago I was sitting at my computer and I started having a heart attack. I immediately called 000 and an ambulance was at my door within 5 minutes and I was administered medication. I was taken to the local hospital where I was given further medication until my blood pressure returned to over 100. I was then given morphine – whew!! I was then put back in the ambulance and driven to the central Base Hospital where I was in intensive care for 3 days – I was given a full ultrasound and X-Rays in intensive care. I was then transfered to the general ward in a 4 bed room with 2 bathrooms ( 1 had toilet, the other a shower) attached which were clean and well equipped. I continued to have medication administered round the clock. 4 days later when a bed became available I was taken to the airport and flown in a 2 prop small aero-ambulance to Sydney where an ambulance took me directly to The Royal North Shore Hospital. I was assigned a bed in a similar 4 bed room. A couple of hours later I was wheeled up to the angioplasty department where I had a stent inserted for my damaged coronary artery. The next day I checked out and was given a return air ticket back to my home town. Total cost for the whole experience was $300 for the Ambulance, everything else won national health. I understand the local base hospital can now perform angioplasty. Had I been insured I would have gone straight to a nearby private hospital and had the angioplasty performed immediately and the food would have been better. wes it costs 1.5% of your gross income – so someone on $100,000 per year pays $1500. Not exactly heaps! You are surely aware that the Medicare surcharge doesn’t go anywhere near to covering the costs of hospitals etc. janama: I’m sorry to heat that; hope you are well. Being a lawyer I have no fear of heart attacks. wes; you have made a couple of good posts but my replies have been missing in action; I’ll make this simple; have you read this analysis of the correlation between Nazism and enviromentalism? Mark – there is an additional medicare levy surcharge of 1% for those who earn over $77,000 and don’t have adequate private insurance. Currently 45% of the population retain private insurance, the government subsides 30% of insurance payments. Nicely written, my friend. Thank you. “The UN bureaucrats that no one elected, want to decide what happens to everyone everywhere in the world. This is real chutzpah on their part! Considering the fact that earlier this year, an internal report (that didn’t make it to the MSM either … quelle surprise, eh?!) clearly indicated that the UN can’t even get their own environmental house in order! “The relevance and effectiveness of the United Nations’ work increasingly depends on its capacity to turn risks into opportunities”. That must be how the whole AGW movement got started! Someone thought there might be a risk, and they turned it into an “opportunity”! If the upper echelons of the UN really cared about all the noble goals they claims to have, they would recommend that this dysfunctional organization – and all its acronymic offspring – be dissolved, so that the funds could be reallocated to those in need. Yeah, I know … not gonna happen, but I can dream, can’t I?! This effort by the UN is a disturbing demonstration of how bureaucrats seek to expand power far beyond their authority. The UN charter does not provide for anything like what they are doing. It is long past time to shut down any and all of the para-governmental functions of the UN. I believe that the true cost of Medicare in terms of a per annum charge over the population is in the range of 10-12%. There was a Health (sickness?) Minister in the Hawke/Keating years who wanted to raise it to that level but it was believed to be too “courageous” a move. Subject:LABOR WILL DO NOTHING ABOUT ILLEGAL IMMIGRANTS!!! TOO BAD ABOUT NEEDY AUSTRALIANS! CRIMINALS FROM ANOTHER COUNTRY TAKE PRIORITY!! JUST REMEMBER THAT THE LABOR PARTY IN BRITAIN SECRETLY SCHEMED TO CHANGE THE ENTIRE MAKEUP OF THE POPULATION THERE. CLEARLY THE AUSTRALIAN LABOR PARTY HAS THE SAME AGENDA!! Combet is my local member, on polling day 2007 I shook his hand at the polling booth and wished him well, I was surprised at how small in stature he was. I am now wondering in what ways other than continually inundating his inbox with links to the latest papers and blog articles questioning the whole CAGW concept I can best make a nuisance of myself. He was on local radio this morning reciting the “apostles creed”, the vast majority of the scientific evidence confirms the earth is warming, we are to blame, we need to waste more of the peoples taxes by giving even bigger subsidies to clean energy. I was listening in the car on my way home from work. I arrived home before his interview was over, I didn’t bother to sit and listen to the finish, I was getting too pissed off by the interviewers placid acceptance of every thing he said. The one question that he did ask was with the formation of Milne’s climate change committee did this mean Joolya’s citizens assembly was now defunct, HE DIDN’T KNOW, he was not privy to those negotiations. DOES THIS MEAN THE KITCHEN CABINET IS STILL IN VOGUE, JUST PAINTED IN A NEW SHADE OF GREEN. The linkage between environmentalism and German National Socialism is correct – I was a little stunned discovering Hitler’s Mein Kampf as a greeny reference used by some I know. I was also struck by Keating’s last hurrah when he lost to John Howard – the ALP election slogan was “Leadership Matters”. Fuehrer is German for Leader. We are still fighting WWII it seems. Apropros hospital etc, I just came out of hospital with a heart problem (quickly mending itself) and while I had full private cover, and the option to go to a private hospital, I never the less ended up in a public hospital near Midland. No complaints and discreet enquiries indicated it was recognised nationally as the place for heart problems with excellent staff and facilities. I was in there for 7 days, and now back at work (light duties) until I finish the final tests during the next month. (Actually I had little choice in where I went – the hospital was 1 km distant from the surgery ). As for the UN, it’s important to understand who and what political philosophy founded it after WWII. It replaced the League of Nations that too was a Fabian contrivance. I’m reading “The Hidden Evil” by mark. M. Rich and remain ambivalent about it. I think that when David Rockefeller publicly admits he and his fellow Bilderbergers are thinking about a world government to stop war, we should take him at his word. Eliminating national sovereignty in order to eliminate wars seems admirable in one sense, but at the expense of our freedom? Louis; my best wishes for your recovery; this seems to be the heart ailment thread! Just to set the record straight about Australia’s health system. The public system is not “third world”. It is very good. My elderly father was involved in a car accident just over a year ago. He was flown to Perth at no expense to him. It was touch and go for a while in the serious trauma unit of Royal Perth. Then he was transferred to Shenton Park Rehab where he steadily progressed until he was finally able to move after about 4 months. While there, he got physio, occupational therapy and dietary advice as well as great care. The food was crap. He has private health cover, so at that point he moved to a nice private hospital in Bicton, where he stayed for another couple of months until he was well enough to go home (more physio and ot). The food in the private hospital was excellent. The cost of the whole thing was at most a couple of thousand dollars. So are ordinary people taxed to the hilt to pay for this? No, somehow we manage to do it. Perhaps because we don’t spend all our money invading other countries (sorry, couldn’t resist a little barb ). I don’t understand why many US people are so scared of having a decent health care system. I doubt it, more likely it will be enforced viewings of St Algore’s (award-winning) comic horror movie! We have a better health care system than Australia. And we do not pretend that something flying a patient many miles is ‘free’. And your attitude on ‘invasion’ is one that should be noted for when China decides they need some nice flat space with good coal reserves and pretty opals. Good luck, Louis. take care of that heart and the electric field around it! Janama, I am please that your angioplasty went well. Watch the cholesterol! To all you sickos out there including Johns dad, good luck to you all. I’m glad you’re still with us to share your wisdom. Louis leave Paul Keating alone, he is my hero. Thanks for the great link! Been reading it all night. I was aware of the sturm un drang, children of the soil, pagan nature imagery in the National Socialist movement and the whole idea of nature-based racial purity. But I wasn’t aware of how ecologically sensitive the Nazi were. I suppose something similar could be said about the art and philosophy of imperial Japan. Now that you point it out the – ecofascist to the Greens and anthroposophical to Lovelock’s Gaia hypothesis – parallels are striking. Contemporary Greens are coming from a Marxist analysis of history, which has the advantage of being so much better anything that came before. You know, history as a list of battles and genealogies. Marx is all about following the money. But if you think about it it’s ironic because Marxism says zero about ecology and is in fact “Prometheanism” a radical form of statist industrial capitalism. Nature to Marx was nothing but a resource to be appropriated by the state and exploited to the fullest extent. Also the Green have a strong pseudo-pagan, magic mushroom, unicorn flavor that is eerily similar the Nazi desire to enshrine a long lost Teutonic tribal state of existence. When people say healthcare should be free, what they really mean is that it should be compassionate. Fact is, nothing is free and basic rights and services should not be prostituted off. The issue doesn’t have anything to do with private vs. government, i.e. it isn’t an endorsement for government over privately operated since the natural laws of markets are disrupted by regulation anyway, therefor government run= lesser of two evils. It seems odd that on the other hand, big bureaucracy is basically responsible for virtually every issue discussed on this blog. That’s pretty much a testament to what I’m saying. Wes, yeah, Marxist theories are interesting. Purists will say that Marx was opposed to the state, currency, class etc; in fact he was probably an early post modernist and idealist, but certainly not a pragmatic one. Communism practically speaking is statism but one that coerces its citizens into a classless, money-less, stateless society. Ironically, you need a state to enforce ideology but apologists believe it is still achievable without one. Strangely, it doesn’t occur to them that unless the entire country wants to collectively embrace nihilism, you will have to force them to. Strange. Socialism appears to be a lightweight warm and fuzzy version of the above where state interventionism is encompassed in the general theory. Anyway, lots of Nazi nativist theories on this site. If I need further help, they can set things up with a specific doctor for it, and so far as I know, that is also free. Not government health care. It comes out of my own pocket. However if I am willing to wait THREE MONTHS, getting progressively worse (and possibly NOT making it that far), then I can get it for free. Does that sound reasonable to you? No. But here if a person such as the two relatives I mentioned the patient who is serious receives number one priority. Less serious maladies are relegated to waiting lists. Of course, seeing a specialist such as an opthamologist may also take time to arrange an appointment. But the moment I was diagnosed by an optometrist with glaucoma I was instantly given the next appointment to a specialist. When I had an appendicitis attack my wife asked the ambo to take me to a private hospital. But had we not been insured I would still have been operated just as well and straight away at a public hospital next door. One trouble that causes concern and hold ups in our system is that it is TOO free. That is, the most wealthy can utilise the free system rather than the private. A ‘means test’ should be applied but this is below the rich person’s dignity so they cry. They claim they pay taxes (true) so they claim the right to use free systems for minor ailments. But the pay into a private health insurance in case they need superior single bed room 3 course meal 5 star treatment for more serious occasions. that bought carbon offsets to neutralize its carbon footprint was unaware that poor Indian farmers had been aggrieved by the green project. Once again A BANK out for some easy green money. Like his father before him, Yashwant Malche has worked the same piece of land on this parched plateau a day’s drive and decades away from Mumbai. As an adivasi, or tribesman, he and his ancestors have been relegated to desolate land like this, mostly left out of India’s modernization. But in 2007, strangers came offering $4,000 and marking off his land. They said they’d build windmills, part of a power project built and sold – in part – to create profits from carbon offsets. It did. The Dhule wind project brought the erection of about 550 windmills on land used by 2,000 adivasi. The tussle over the land resulted in a confrontation between stone-throwing tribesmen and truncheon-wielding police, bringing tear gas and arrests. Some 12,000 trees were cut to erect the turbines. The footprint of one windmill took less than an acre from a corner of Malche’s small farm. But the loss means he no longer earns enough farming and now must spend part of the year in another state working in sugar-cane fields. He used to own three sets of clothes, he now makes do with two. Pluuueazzeee. There isn’t a rich person in all of Australia that would put their life in the hands of the public system for a voluntary procedure. Don’t construe my critique of universal medicine as a diss towards our heroic emergency services or dedicated nurses and doctors who among the world’s best. They’re not the problem. I’m not rich and my family is privately insured because if one of us gets sick I don’t want a health bureaucrat struggling to tame budget overruns to decide our doctor, our treatment and how long we’ll have to wait and where we will be treated. It’s that simple. My point is that socialized medicine pretends it is more equitable than the US system when in fact we still have two systems, a private one where you chose your doctor, therapy, etc and a public one where the government assigns your care according to cost analysis tables and availability. Worse we depend on the American system we diss as our source for medical innovation! One problem is the myth that the health care system is free as illustrated here – the so-called $300 angioplasty really costs more than 100 times that. I worry that as our population ages with less new taxpayers coming it at the bottom and more elderly needing “free” angioplasties, cancer treatment, etc, who is going to fund it? I worry that the government medicine won’t be able to afford the latest best services and procedures and the system will inevitably slide. The tendency will be for the government to increasingly ration services as they are already doing in all universal systems. I don’t have any answers…All I am saying is that our American friends should be very wary of exotic economic claims for universal medicine especially in a nation of 300 million with an already functional, innovative market-base system that can respond to demographics and other perturbations by freely evolving unhindered by a centralized top-down command regime. And we Australians should understand that without the de-centralized American health system ever innovating on the bleeding edge ours would be something less than it is. More information about this TREASONOUS UN Lima Declaration…..
All Australians should be very concerned right no as K Rudd leaves to visit & grovel to the UN. Someone should remind him that neither will come to pass. His skin is far too pale for that. Politics is the business of getting power and privilege without possessing merit. A politician is anyone who asks individuals to surrender part of their liberty— their power and privilege— to State, Masses, Mankind, Planet Earth, or whatever. This state, those masses, that mankind, and the planet will then be run by … politicians. With the release of Al Gore’s propaganda movie ‘An Inconvenient Truth’ and with the help of the media the public has been driven into a mass hysteria based not on science but lies. You will learn that there is no empirical evidence that man-made CO2 is the primary cause of the mild 0.6c increase in temperature over the last 100 years, Carbon Dioxide (CO2) is not pollution, pollution has nothing to do with global warming, Al Gore and his movie are a fraud, there is no “consensus” on the cause of global warming, the earth has been warmer in the past then it is today, the land based temperature stations are biased and their temperature records have been “adjusted”, Antarctica is not melting, Arctic sea ice cannot effect sea level, sea levels are rising millimeters not feet, computer climate models are worthless, polar bears are not endangered or dying, droughts and hurricanes are not caused or made worse by global warming and there is extensive evidence of natural causes for global warming such as increased solar activity and orbital variations. The current man-made global warming hysteria is largely driven by the environmentalist movement in an attempt to reshape western society away from capitalism by implementing state control (socialism) over private energy usage (Carbon Taxes, Cap and Trade). These environmentalists wish to get rid of the suburbs, SUVs, single family homes and return western society to a neo-urbanistic state of living. This is because the current environmentalist movement is filled with ex-communists and neo-socialists who have long ago abandoned science and replaced it with their politically motivated environmental “religion”. Don’t believe me? Go ask any “environmentalist” – socialism or capitalism? No, not all scientists even those who support man-made global warming theory seek these politically motivated intentions but their position has been distorted and exaggerated for political gain by extremists. I have created this page to help shed light on what you have not been told. AGW, the cold war of the 2ist century. How long before the science-muzzle censorship reaches Australia? Canada has it now. Here’s a bit of “feedback” from the far side of our significant planet. Apparently, not much is wrong with nature. Except that some are deluded into believing that they understand it all and that they need to make it better. The Ministry of Truth seemed so far fetched. Now I can easily believe it. Pluuueazzeee. There isn’t a rich person in all of Australia that would put their life in the hands of the public system for a voluntary procedure. BTW, I’m not rich but keep my private insurance going for obvious reasons. But I repeat that my two relatives who were diagnosed with bowel cancer received immediate surgery with positive outcomes. What is with marxist leftists and sanity?? THE COMMUNIST LABOR PARTY WANT TO ACCESS YOUR EMAILS AND INTERNET WEB BROWSING HISTORY!! !